That's HB for "hollow body"
If you're both a little bit country and a little bit rock 'n' roll, chances are you've had a hard time finding a guitar that gets all the tones you want. The new Gadow Custom Set Neck HB might solve your problem. Joining the ranks of Gadow's handmade guitars is the Custom Set Neck HB (that stands for "hollow body"), a very elegant-looking instrument. 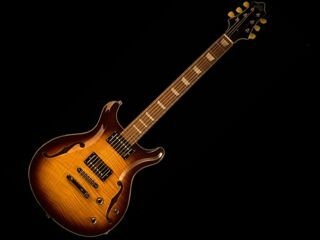 The Setneck HB will come standard with Seymour Duncan pickups in humbucker or P90 configurations, a mahogany body with figured maple top, Tone Pros bridge, Kluson Keystone tuners, traditional f-holes, and a specially designed hollow cavity to improve on the resonance and sustain. The necks will feature an Indian rosewood fingerboard, a genuine 1-11/16 inch bone nut and mother of pearl trapezoid inlays. The Custom Set Neck HB will retail for $4999.00 US. There is also going to be a Special Edition Set Neck HB, limited to just 25 pieces, which will retail for $5695.00 US. The special edition will feature a Korina body with a figured maple top and a solid Indian rosewood neck. For more information, visit the official Gadow Guitars website.